[150 Pages Report] The filtration and contamination control market is estimated to reach USD 39.73 Billion by 2022, at a CAGR of 5.13% between 2017 and 2022. The base year considered for the study is 2016, and the market forecast has been done for the period between 2017 and 2022. The report aims at estimating the market size and future growth potential of the market based on filtration type, customer type, application, and region. The report also aims at providing detailed information regarding the major factors influencing the growth of the filtration and contamination control (drivers, restraints, opportunities, and industry-specific challenges), and strategically analyzes the micromarkets with respect to the individual growth trends, future prospects, and contributions to the total market. The research methodology used to estimate and forecast the filtration and contamination control market begins with capturing data on key vendor revenues through secondary research. Some of the secondary sources used in this research include various filtration and contamination control associations and organizations, such as the Global Society for Contamination Control (GSFCC), the Institute of Environmental Sciences and Technology (IEST), the National Fluid Power Association, the National Air Filtration Association (NAFA), the Canadian Standards Association, the American Filtration and Separations Society, the Federation of Environmental Trade Associations (FETA), and the European Committee for Standardization (CEN). The vendor offerings have also been taken into consideration to determine the market segmentation. The bottom-up procedure has been employed to arrive at the overall size of the global filtration and contamination control from the revenue of key players. After arriving at the overall market size, the total market has been verified through primary research by conducting extensive interviews with key experts such as CEOs, VPs, directors, and executives. The market breakdown and data triangulation procedures have been employed to complete the overall market engineering process and arrive at the exact statistics for all segments and subsegments. The breakdown of the profiles of primary participants has been depicted in the below figure. The filtration and contamination control markets’ ecosystem includes filtration component and equipment manufacturers and suppliers, system designers, machine manufacturers, product manufacturers, filtration system and software programmers/designers, research labs and institutes, prototype development and testing, assembly, distribution, marketing strategies, installation, and after-sales services. The marketspace comprises major players such as MANN+HUMMEL Holding GmbH (Germany), Donaldson Company, Inc. (U.S.), Cummins Inc. (U.S.), Parker-Hannifin Corp. (U.S.), Pall Corporation (U.S.), Clarcor Inc. (U.S.), Filtration Group Corporation (U.S.), Eaton Corporation plc (Ireland), HYDAC International GmbH (Germany), and CECO Environmental Corp. (U.S.). 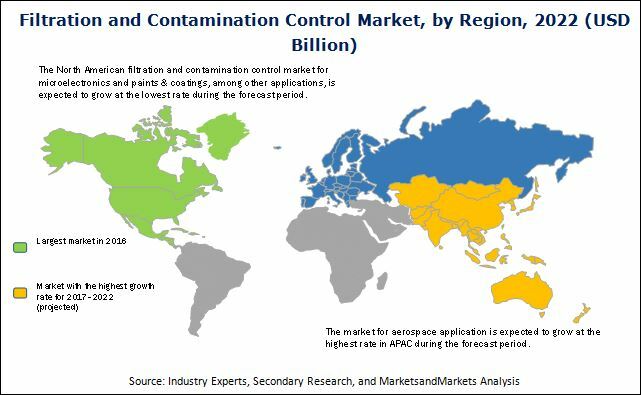 The global filtration and contamination control market is expected to reach USD 39.73 Billion by 2022, at a CAGR of 5.13% between 2017 and 2022. The market is expected to grow substantially owing to the growing demand for cleaner fuels due to stringent environmental emission standards, strong demand for filtration across on-road and off-road applications; and requirement of higher power efficiency performance among mechanical equipment and factory processes. The filtration and contamination control market has been segmented on the basis of filtration type into liquid filtration and air filtration. Classification based on customer type includes aftermarket and OEM (first fit). The market has been segmented on the basis of application into engine and industrial segments. The industrial segment further includes industrial machinery, oil & gas, aerospace, gas turbine, power generation, and others. The industrial machinery subsegment further includes end users in pulp and paper; chemical and petrochemical refineries; and iron, steel, and other metal manufacturing industries. The engine application segment has been subsegmented into on road, agriculture, construction, and mining and marine. In the overall market, the industrial filtration segment is expected to grow at a higher rate because of the high rate of deployment and diffusion of filtration devices in applications across the industrial machinery segment. The market for OEM (first fit) customer type is expected to grow at the highest rate during the forecast period. Growing number of new power generation facilities and exponential rise in demand from on-road vehicles are the key factors contributing to the growth of the OEM (first fit) customer type. Liquid filtration holds the largest share of the filtration and contamination control market. Mobile engines; process industries (including pulp and paper); chemical and petrochemical refineries; and power generation are some of the industries strongly dependent on liquid filtration. Growth of these industries in emerging economies such as China, India, Brazil, and Saudi Arabia is expected to drive the liquid filtration market at the highest rate during the forecast period. In 2016, North America led the filtration and contamination control market, followed by Europe and APAC. The U.S. held the largest share of the North American market, followed by Canada and Mexico. The filtration and contamination control market faces some challenges associated with fluctuations in raw material costs. The increasing demand for electric vehicles is currently acting as a restraint for the market growth. This report describes drivers, restraints, opportunities, and challenges pertaining to the market. Furthermore, it analyzes the current scenario and forecasts the market till 2022, including the market segmentation based on filtration type, customer type, application, and region. Some of the major companies in the filtration and contamination control market include MANN+HUMMEL Holding GmbH (Germany), Donaldson Company, Inc. (U.S.), Cummins Inc. (U.S.), Parker-Hannifin Corp. (U.S.), Pall Corporation (U.S.), Clarcor Inc. (U.S.), Filtration Group Corporation (U.S.), Eaton Corporation plc (Ireland), HYDAC International GmbH (Germany), and CECO Environmental Corp. (U.S.).